A bunch of different baby gifts for a mom at my daughters' school, including a Baby Genius Burp Cloth and a Baby Genius Bib-o-Love. 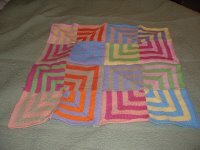 Not thrilled with the Bernat Handicrafter Cotton; probably won't use it again. With the advent of a new great niece I decided it was time to knit something (as if I didn't already have a gazillion projects a humming in the house...) Anyhoo, I thought I'd use the Nina Shawl pattern. I love all the M-D patterns, but this one is especially cute and quite adaptable to a baby blanket. 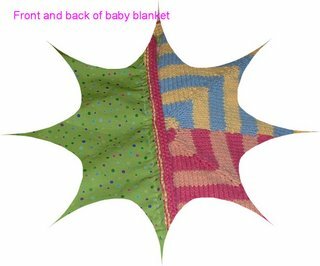 I'm hemming the ends and will be sewing on a bit of cotton flannel to the back to cover the not-so-hot bits and knitting in cotton yarn (darling baby Kate lives in San Diego). My only hope is the thing doesn't get too wild, but then what else are crazy great aunts for if not a little wildness, right? 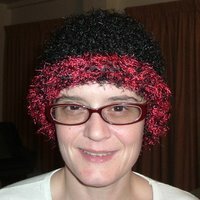 I finally finished a calamari knitting project! Only took, umm, 7 months??? Yeah. Anyway, here it is! It's rug for just inside my back door. With the snow and all up here in Canada, it was getting sloppy there. Calamari rug to the rescue! Started it and finished it last night! I'm about 3/4 of the way through my first Bubbly curtain and I'm so happy with how it's turning out! It's actually longer now than in this photo, and it's coming along quite quickly. I think I only have 1 more of the repeat sections to go before I'll be done. I'm using the Euroflax sportweight on size 5 needles exactly as recommended. 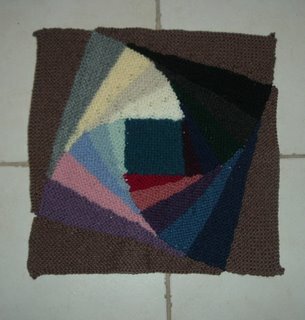 Can anyone recommend the best way to wash this in preparation for blocking? I understand the linen "relaxes" after washing. Does this mean it needs a soap and water wash by hand? With any particular type of soap? Or will a thorough wetting down do? 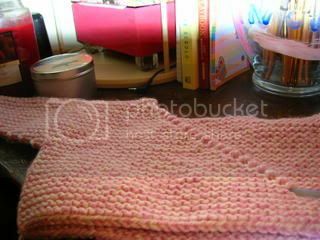 I don't think I've ever had as much fun knitting dishcloths. I just love these Log Cabin wannabes. 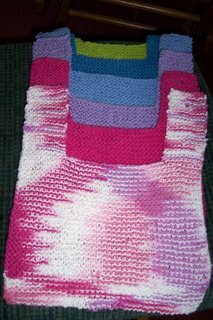 I used #7 Denise Interchangeable and SnC in Tea Rose, Yellow, Rose Pink, Soft Violet, Soft Teal, Light Blue, and Butter Cream Ombre for the first cloth. 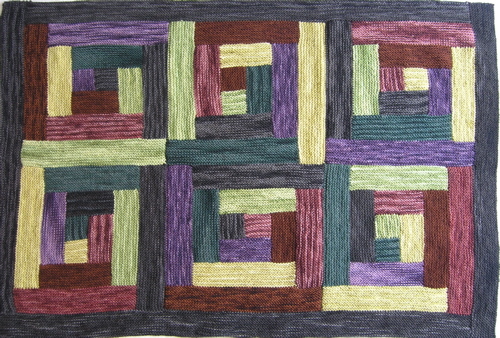 Again, #7 Denise and SnC in Midnight Magic, Dark Pine, and Sage Green. I have a vision of drawers full of mini Log Cabins, each one unique. 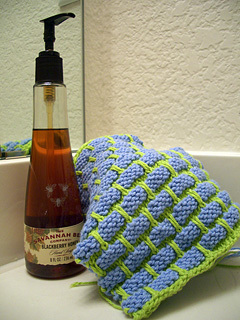 Details and my position on dishcloth requirements are available on my blog. 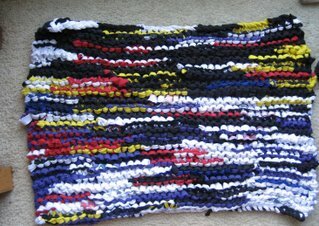 Also on the needles, my new bathmat. I'm using Denise #15 and Peaches & Cream Double Worsted. I'm really liking the colors: Hunter, Bright Navy, and Blue Swirls. Why is everyone leaving the KAL for the new Blogger? I just updated to the new version and I had no trouble and didn't have to leave any blogs behind! 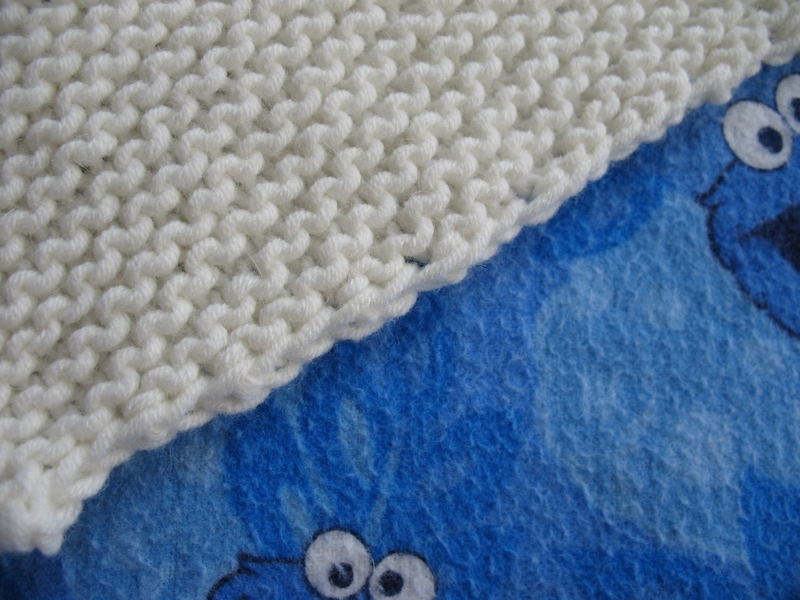 First, the I-Cord edging. I love it, but it seems 2 rows look better. And it's taking almost as long as it did to knit the darn thing! Second, and more seriously, what I call POOCHING. What the hell are these bumps? They're at the end of the short row shaping for the back. I haven't blocked yet, but am doubtful they'll flatten out. Should I cut, unravel and graft? Or be content with breast-like bumps right above my bum? I just finished a mitered square blanket thats been in process for awhile now. I'm really happy with the way it turned out, more pics and the details on my blog. 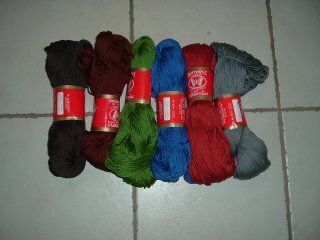 Thanks for such a fun knitalong! 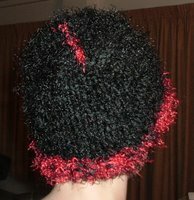 How much would you charge for a ballband? 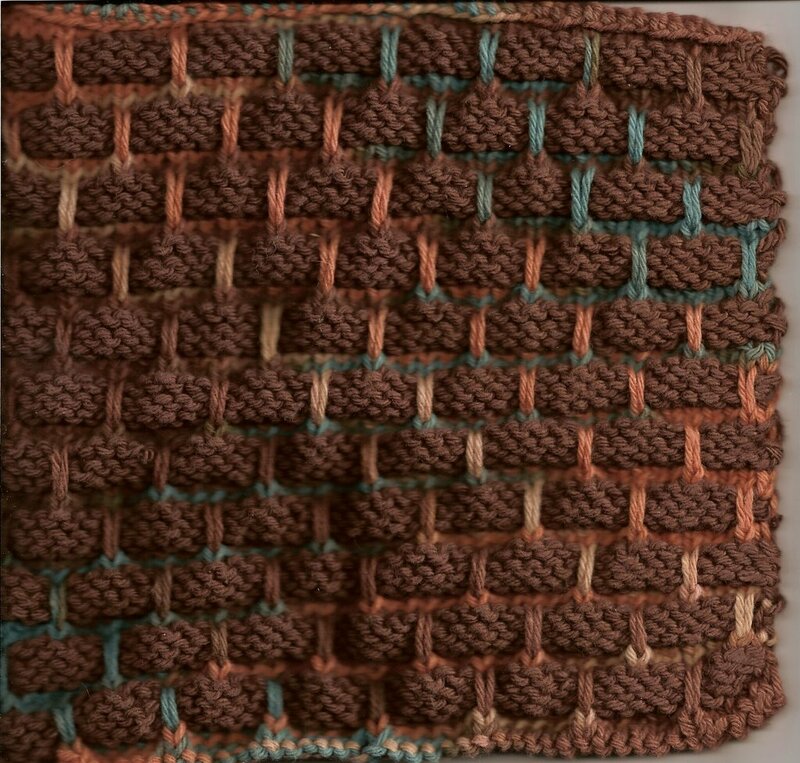 Finished another ballband dishcloth the other day. It's Sugar 'n Cream, colors are hot green and periwinkle, I think. 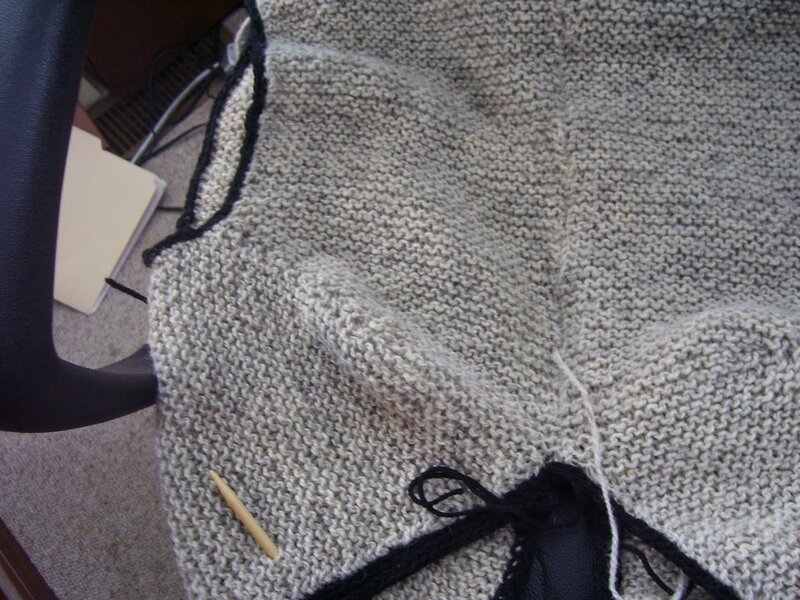 Still need to weave in the ends. 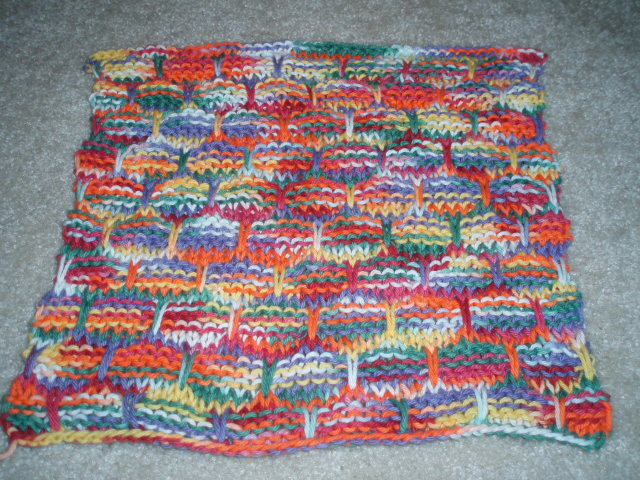 Inspired by a photo at Ann and Kay's blog, I bought some Jojoland Rhythm yarn and started knitting it into Log Cabin squares. The yarn changes color gradually, and I'm thrilled by the results! Each square was knitted from a different ball of Rhythm. I am thrilled with the finished project. 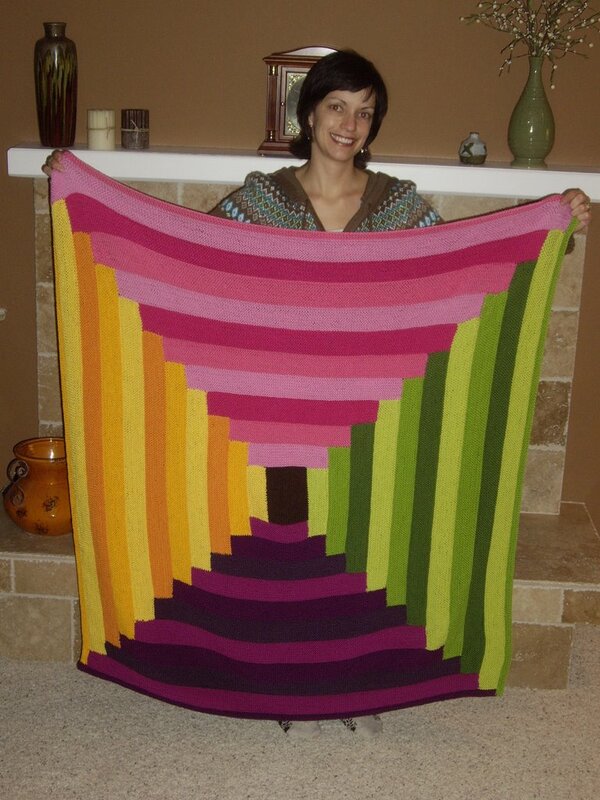 I salute those of you who make an entire blanket! 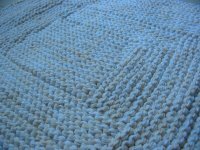 Hi I am making a log cabin blanket where you go round and round making each log longer and longer and I am getting bored with it so I have an design question I tought I would ask to see if you all think it would work. 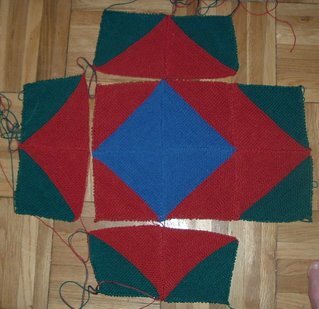 Can I when I bind off the log I am on now then start(seperately and when complete whip stitch it to it) the smaller log cabin squares and make 2 or 3 per side and add them on to make smaller log cabin squares around to frame the log cabin big square that I have done so far. I think it would look neat I am just not sure how it would work out so I thought I would toss in the idea for opinions before I try so what do you think?? Thanks ahead of time for any ideas on whether this will work or not or ideas on how to make it work. It's a Baby Genius Coaster! Love the pattern, needed new coasters, had leftover yarn...it was a no brainer! Details on my blog. Finally, a finished 2007 project. I love this blanket but it's a gift. So off it goes. 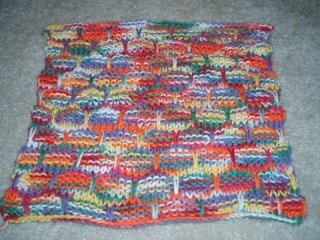 I have enough Nature Wool left to make another, but I think I'll save those for some matching pillows. 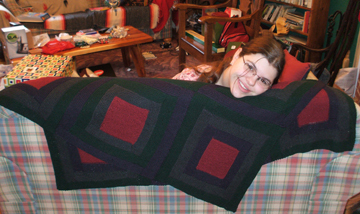 It's a good sign that as soon as I finished this project, I wanted to cast on for another log cabin blanket. 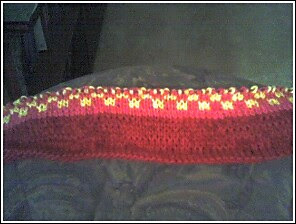 It's a great project for knitting in a dark movie theater, where the bulk of this was knitted. More details at my blog. 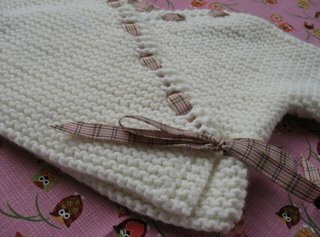 Thanks to Pat and Steve from Woolly Thoughts for the pattern and for otherwise feeding my blankie fetish! It has been forever since I last posted, but I've finally finished something worth looking at: a baby log cabin! This one happens to be a Random Chance log cabin, an idea I saw at Cara's blog here. 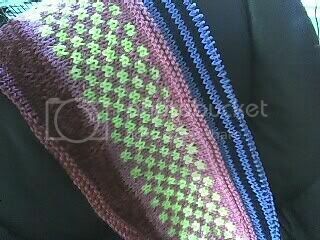 This was made with six colors, one skein each give or take a little, all Malabrigo. I started sometime in August, so I am really glad to have this ready. My freind is due in February, so I'm just in time! Believe it or not - it's hard to see - this is the back. Has anyone adapted the kimono to fit a larger child? Say a three year old? I have chest (24") and shoulder to waist (13") measurements for a friend's twins. I'd like to just adapt this pattern but I'm not sure how to go about that. I really want to knit kimonos for them b/c apparently, it's the cool thing to wear to ballet class! Any help is MUCH appreciated. You can e-mail me if that's easier than leaving a comment at knitsnsuch@yahoo.com. Im trying to switch over to the new blogger & cannot do so without leaving some of my favorite blogs. Please let me know when this blog converts to the new format! Solid white Peaches & Creme from a one-pound cone I had & a ball of pink/purple/white variegated for which I've lost the ball band. Details of the ties on my blog. Hi again! A few months ago, I posted about the pink kimono I made for a girl at my church. She didn't care for pink. Well, this time I made sure I checked into color preferences! 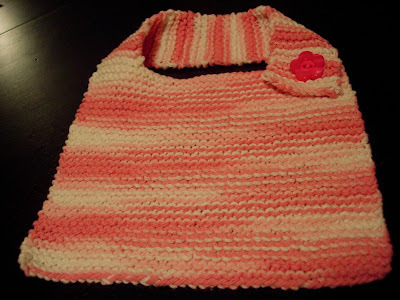 I was invited to a shower for our formar pastor's wife, and her registry said "please, not too much pink." Preference noted. 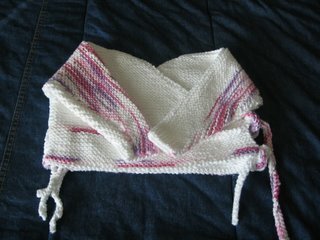 =) Anyway, I made this kimono out of TLC Cara Mia, a (discontinued) machine washable yarn with angora in it. It is so sweet and soft. 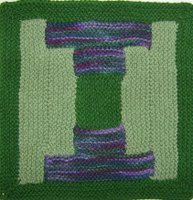 The only changes I made to the pattern are the same ones I made the first time--a knitted cast-on (instead of backward loop) and a sloped cast-off when shaping the sleeves. As you can see, the sloped cast-off makes such a nice smooth edge on the sleeve. There is a little more info about this kimono on my blog, and I invite you to stop by sometime. Have a great day, everyone! P.S. I love seeing everyone's finished MDK stuff! I'm sure this knitalong is going to be around for a long, long time. I whipped up one of the dish cloths with some cute rainbow cotton Sugar n' Cream last week. I didn't use a contrasting color, but I think the results turned out great. Mr. Roosevelt might not think so, though. (He's the model of all things knitted at my house!) Haha. 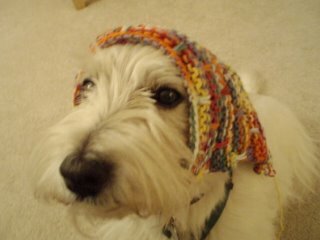 We call this look the babushka. For anyone who has done a mitered square blanket. 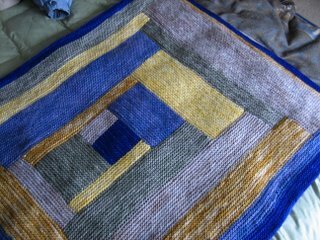 What did you do for washing and blocking, each one individually, in bigger squares of four or the whole blanket (my dorm's not big enough!)? 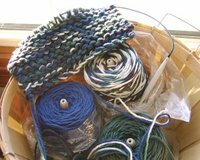 And a question regarding charitable knitting on my blog. Do you wash and block? Do you wash/block your bibs O love before gifting them? 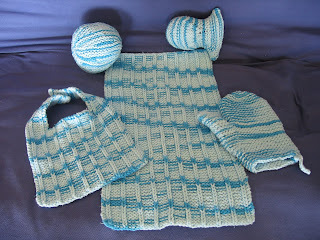 More baby knitting on my blog. 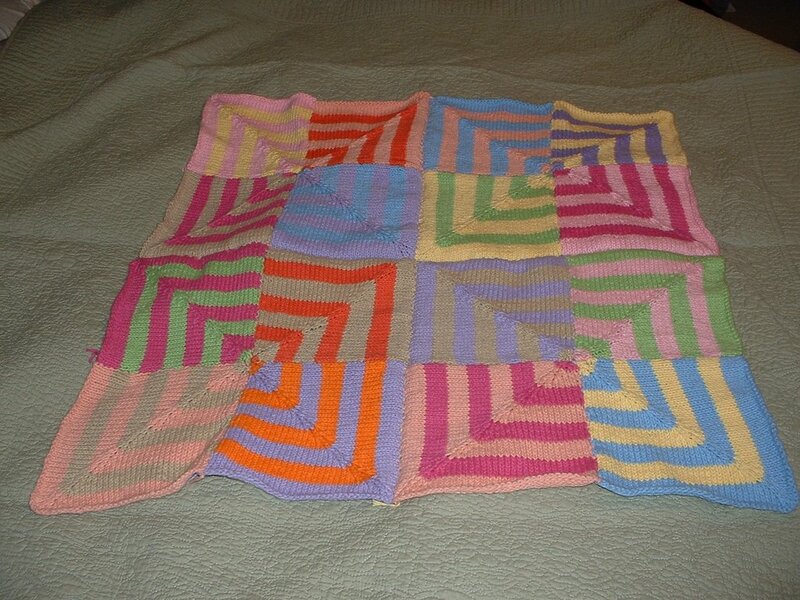 I spent the good part of the morning sewing together mitered squares for a baby blanket. I am planning on adding a border, but wanted to take a couple of photos pre-border. When uploading the photos I decided to use a fun crop and came up with this mitered flower. I guess I am just wishing for spring. 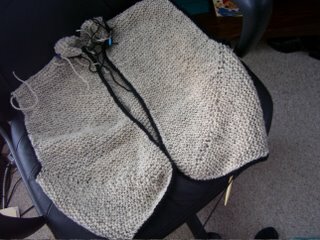 Ok, I've knit two kimonos and have a question. I get the feeling I've made a little mistake. 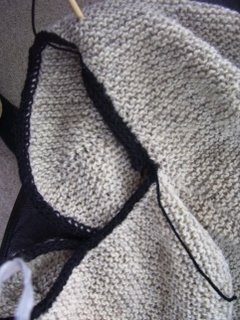 I didn't knit any button holes or any other doo-dad into the garmet to close it. Namely, the pattern didn't really tell me how. :( I bought some ribbon to sort of feed through the loops and close it, but I'm not really sure if this is the best technique. Any ideas, folks? 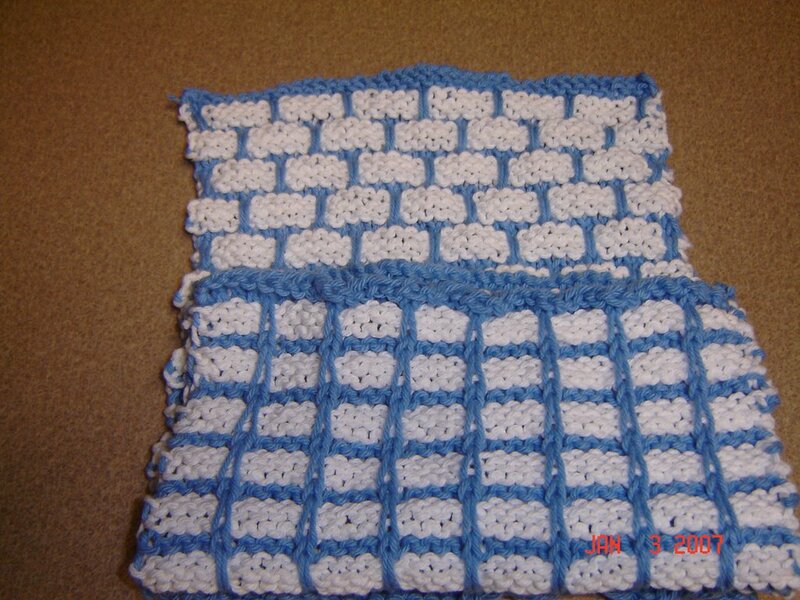 I don't know how to crochet, so keep that in mind when you reply. I just finished my first moderne baby blanket, but as soon as I finished binding off my last stitch, I noticed something I hadn't noticed before. I followed the border pattern to the "T" and noticed that the right side of the work shows the stitches where I attached the border to the blanket. 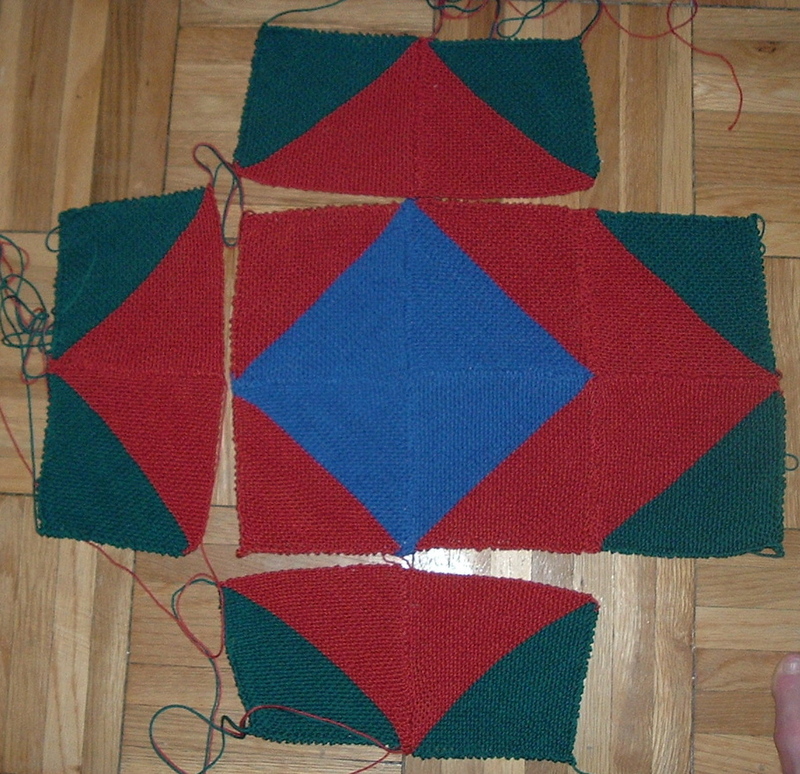 It really doesn't look bad except for the few places where I picked up stitches from the side of a block. 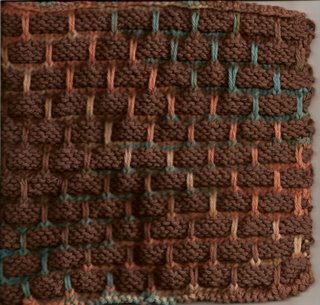 After examination of the pic in the book of the rug (where the border is shown in the book), the stitches show on the right side as well... 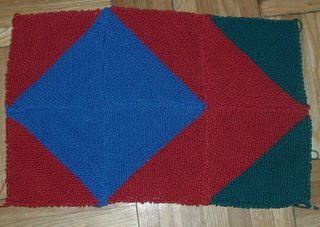 However, I kinda don't know if I like it and am considering frogging the whole border and redoing it to where the stitches don't show.... I don't have any pictures because my dh has our camera in Mississippi. *Just to brag, he's out doing his 2nd trip for hurricane relief on the coast. There's still a lot to do down there, guys! 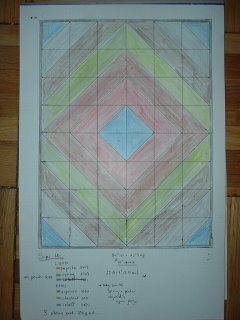 * So, if you can even visualize my problem, please let me know what you think..thanks! 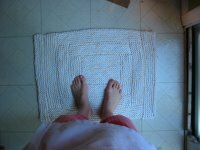 I finally finished my second hand towel! I started it back in August and then got distracted by Christmas knitting. I used the Euroflax linen for my first one, but used cotton for this one. I think I like the cotton better. 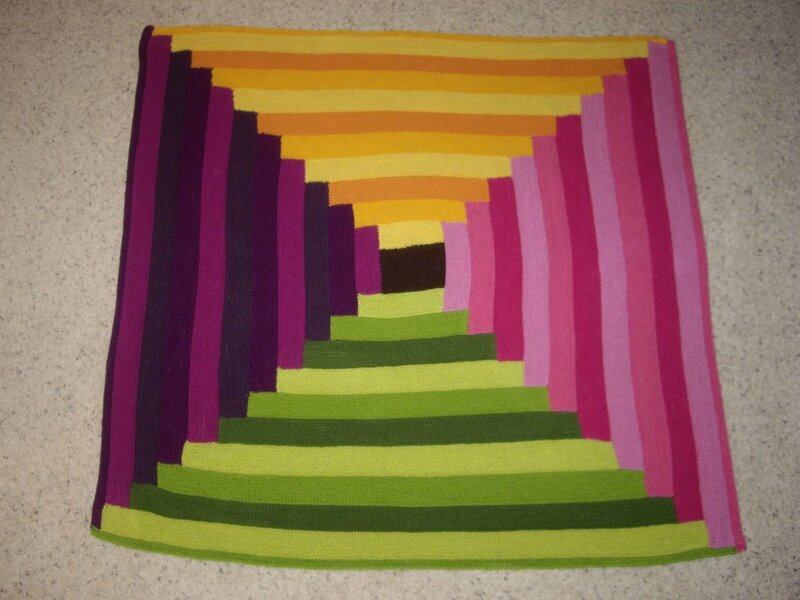 I don't know if I'll make this pattern again, but I'm sure I'll make more hand towels. 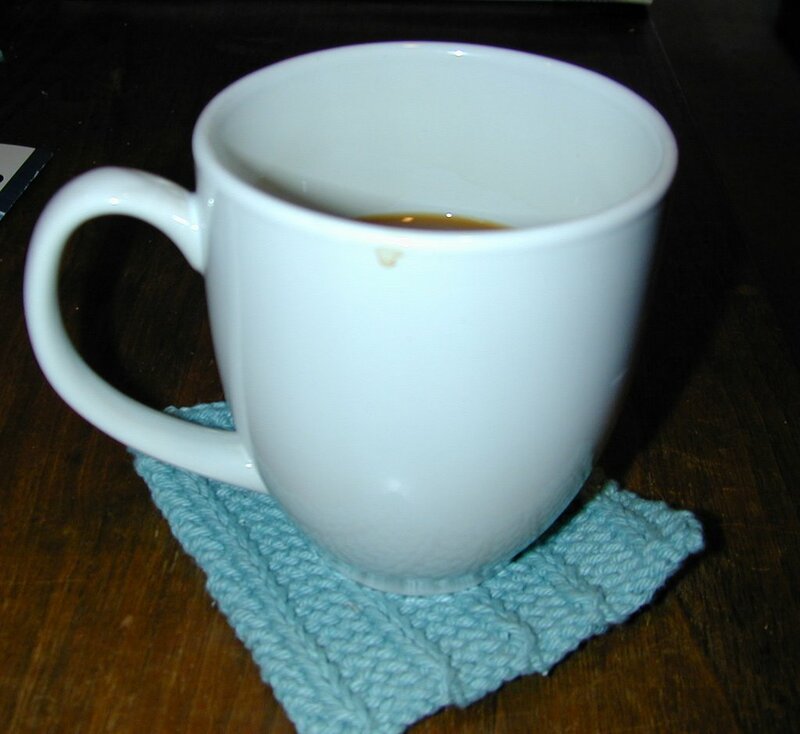 I've completed my Absorba and I'm wondering what the other proud Absorba owners have used to keep it from being a slipping-accident-waiting-to-happen? A standard hard surface rug mat? Were there any moisture issues with that? 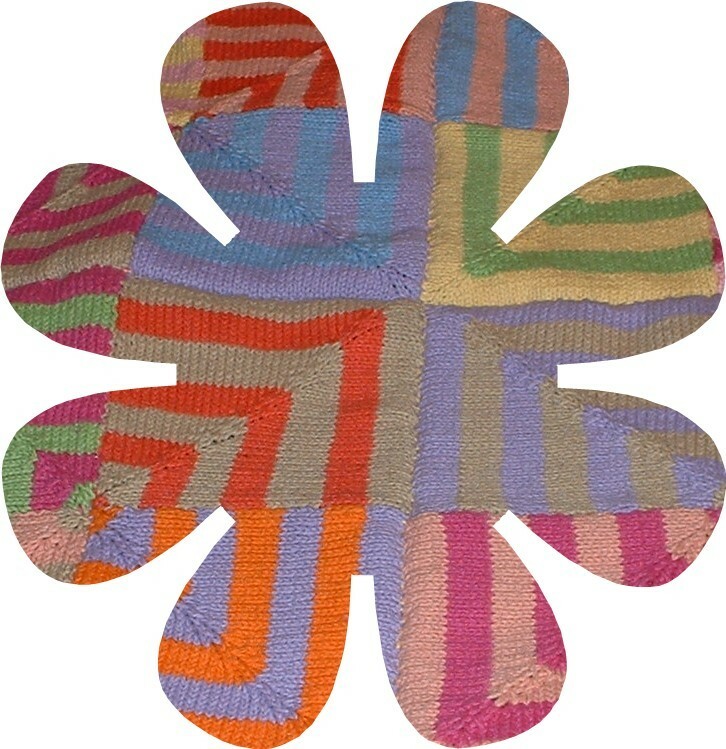 Or did you treat it with rug backing like for latch-hook rugs? Ours will reside on bathroom grade floor tile (not the linoleum pictured). 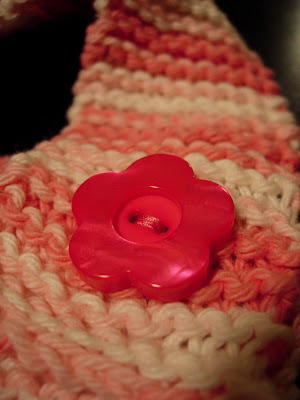 It is currently in use and every bit as squishy-soft as the pattern claims! Specs: I have included my ladies size 10.5 feet in the photo for scale. 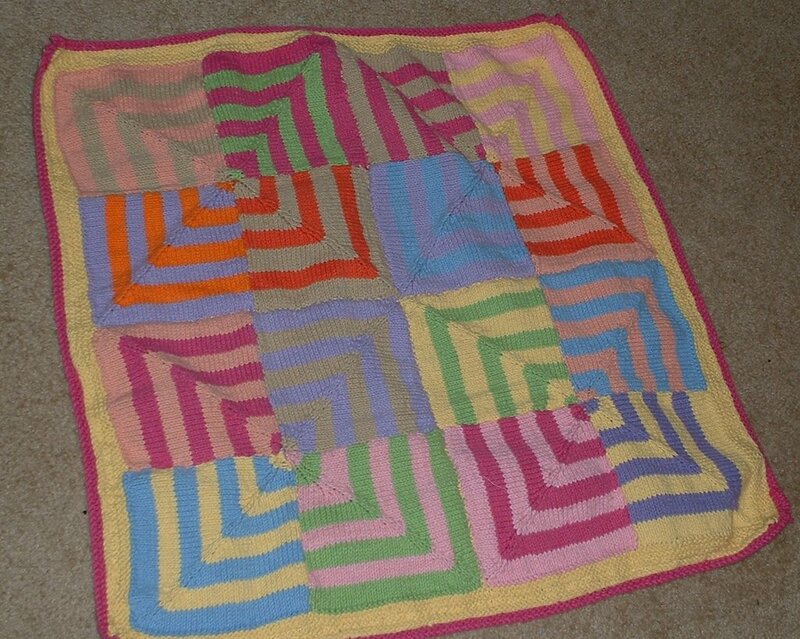 I used a hodge-podge of yarn...this was a stash-busting project. 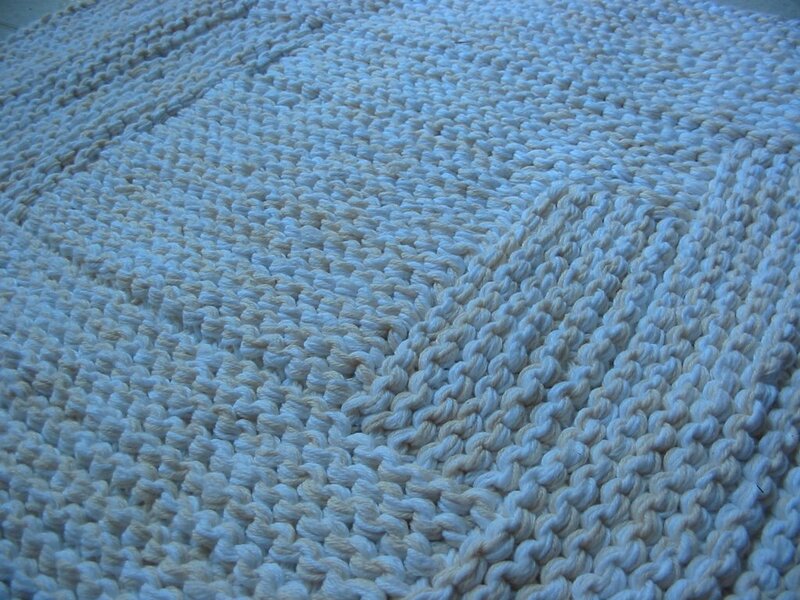 I used 5 strands of worsted weight cotton--2 strands Peaches & Cream cream color, 1 strand P & C white, 1 strand Sugar & Cream white, and 1 strand white-ish recycled yarn from my cotton sweater from a mass retailer I will call O.N. 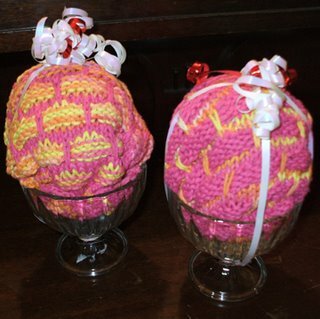 and all the ladies loved the Warshcloth Sundaes! 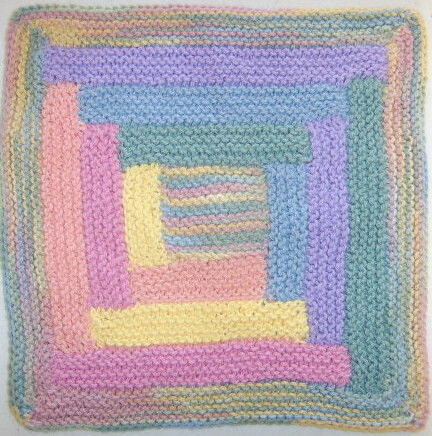 You can read all about the pain and suffering on my blog at http://nautiknitter.wordpress.com. Thanks for all the support and encouragement on the darn blanket! 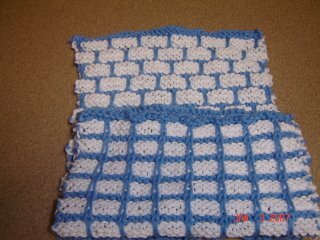 These are log cabin panels that incorporate my grandmother's crochet work. I have only three of her crocheted squares, but I'm making the most of them. 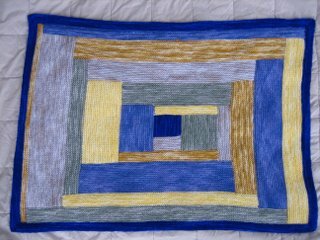 The log cabin panels might grow later on, but in the meantime I'm planning to make more of them in this size and turn them into a blanket. 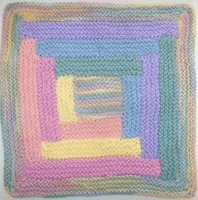 I don't know how to crochet, so the other center squares might just be a sampling of various knitting stitch patterns. We shall see! 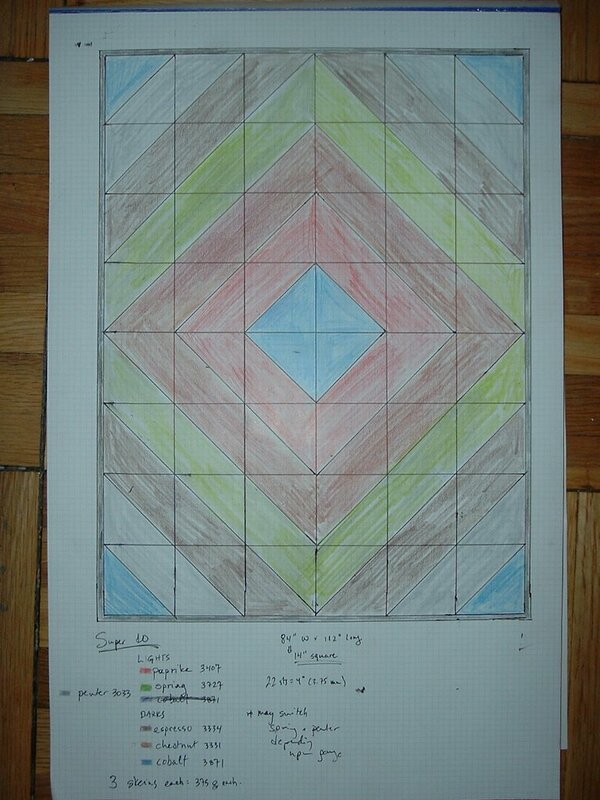 I wanted to share my plan for a log cabin to cover my bedspread. 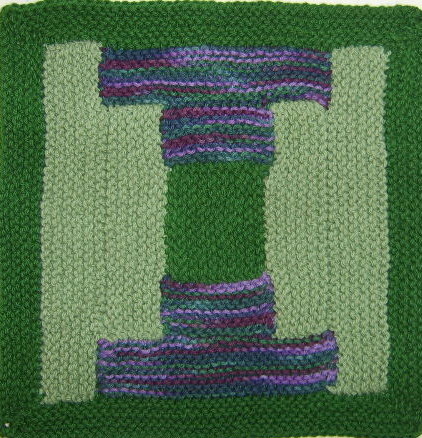 Pattern is courtesy of the Woolly Thoughts people at www.woollythoughts.com - a variation on Tilting at Windmills. Am dying to start but am currently working on a sweater which I promised myself I would finish first. SIGH. Please wish me luck. Counting on good blankie vibes! 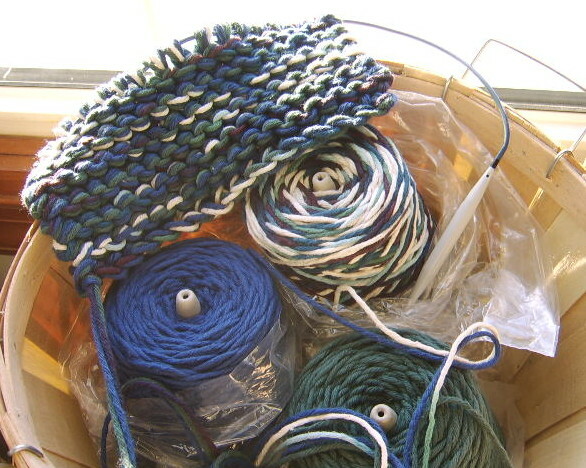 Everytime I sit down to make the Ballband dishcloth, I make the same mistake: I keep knitting four slipping one. 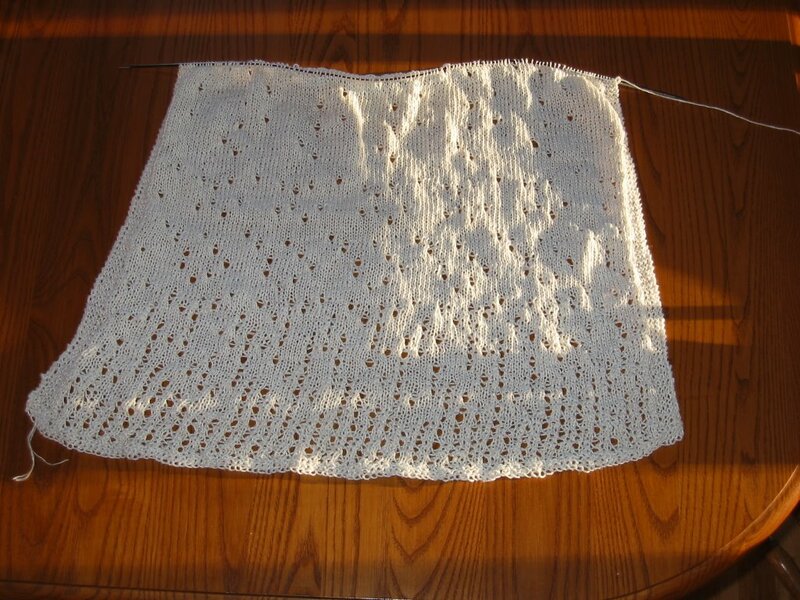 And since I cast on 39 stitches instead of 45 it comes out right. Then I end up tinking back and fixing my mistake. New Year's Eve I decided to just go with the mistake and see what would happen. I actually like the look of the "mistake" and it lies much flatter. I'll still continue to do the traditional cloth, but the mistake has found its way into my bag of patterns.